In Sideways (2004), two men reaching middle age with not much to show but disappointment embark on a week-long road trip through California's wine country, just as one is about to take a trip down the aisle: 13 years later, hit film still makes waves in Santa Ynez Valley economy. Such is the effect of the movie on the territory that we can't even come to think if somebody decided to shoot a movie about wine in Tuscany, already swamped by a massive, increasing number of wine tourists per year. Tuscany is a wine-mecca, way before Sideways was written and shot, a place for wine lovers and a location that contains, alone, a third of the entire Italian artistic heritage. Villa Gioiello, located in the county where Wine Spectator's Thomas Matthews calls his favourite when in Italy, is a fantastic villa. The villas' superior rooms feature large, custom-made beds. 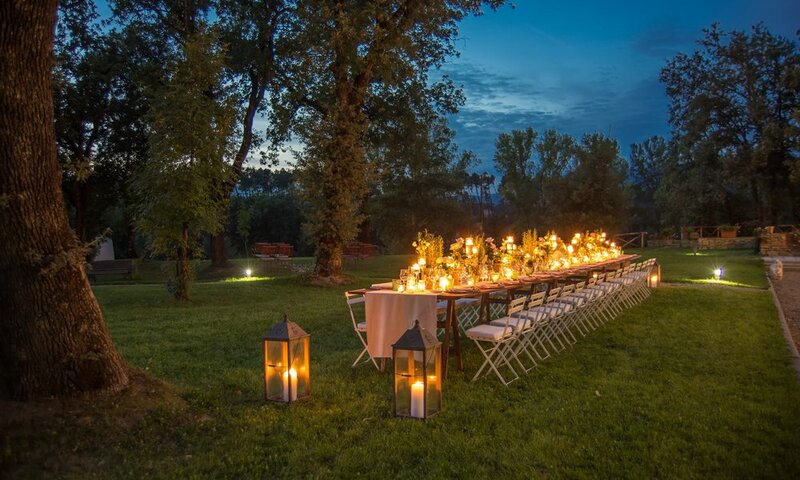 From here, you can enjoy views of the estate and its well-manicured gardens while sipping on a glass from its own wines: Ser Alfiero, Super Tuscan, Bacco Felice, Chianti DOC, Moraia, IGT Super Tuscan and Giannetto, an outstanding IGT 100% San Giovese. The estate Wine Cellar is an authentic gem of rural architecture that rests on a plateau, and serves to demonstrate how man is capable of indulging Nature while respecting landscape and environmental canons. The systems are realised with the use of modern technologies for the purpose of working our grapes, which come from the nearby vineyard, with the use of organic-farming methods that respect their organoleptic characteristics. The fermentation room consists of small steel fermenting vats that are totally computerised for the purpose of controlling the temperature. The barrel room, which is located in thermo-controlled premises, accommodates tonneaux and Tuscan barrels made of top-quality oak. Discover the fascinating world of the gullies which made an impression on Leonardo Da Vinci, as background of Mona Lisa paintings, Giorgio Vasari, and his altar-piece (The Wedding of Esther and Ahasuerus) in Arezzo, together with the thousand-years-old forests of the National Park of the Casentino area. Loro Ciuffenna, not far away, with its medieval (12th c.) mill high over a small canyon, is a Tuscany canyon as only. The estate is less than one hour from Florence (which can also be reached by train from nearby Montevarchi, almost an underground railway). This is a fantastic location to visit Fiesole, Siena, Arezzo, Monte San Savino, Cortona, Pienza, Sansepolcro, Città del Castello, Anghiari, the Franciscan sanctuary of La Verna and the hermitage of Camaldoli. Within 80 kilometres we have Urbino and Gubbio, Perugia, Lake Trasimeno, the baths of Bagno Vignoni and Rapolano, Volterra and San Geminiano.